Ken Smith sent these pictures of four cars from his collection. 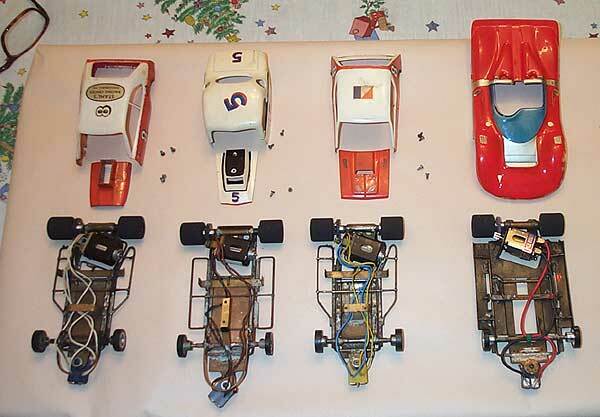 One is a customized 1/24 RTR Riggen chassis from about 1970, and the other three were scratchbuilt by Nevin Snyder. Notice the brass rod sidepods - those are not body mounts, fellas. 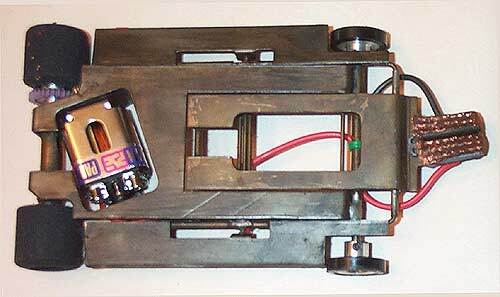 We are looking at slot car Modified Stock Cars or Dirt Cars, and those are bumpers, for fending off the inevitable collisions! 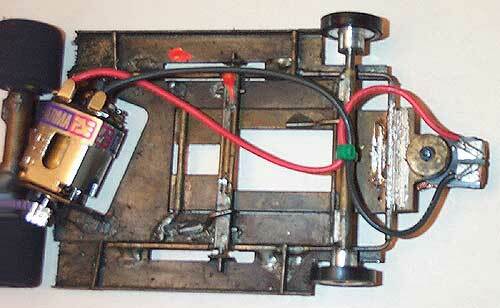 "I have attached some pictures of the slot cars for your enjoyment. I inherited four hand built cars from a friend of my dad's, named Nevin Snyder, who passed away this year. I used to admire him racing his cars when I was a kid - now I am lucky enough to own them." Thanks, Ken, for sending pictures of these cars. This helps preserve Nevin Snyder's memory. 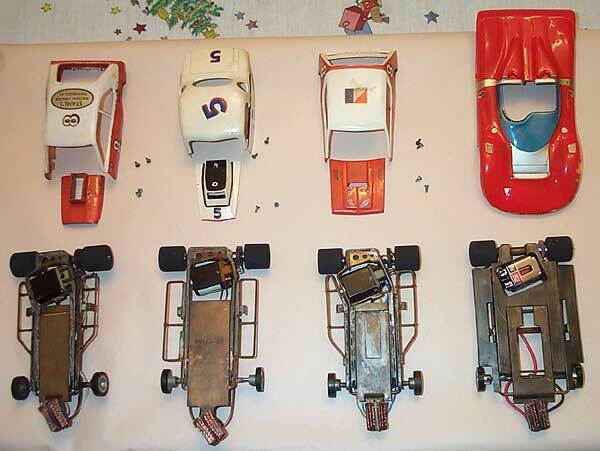 Above: Four slot cars from Ken Smith's collection. 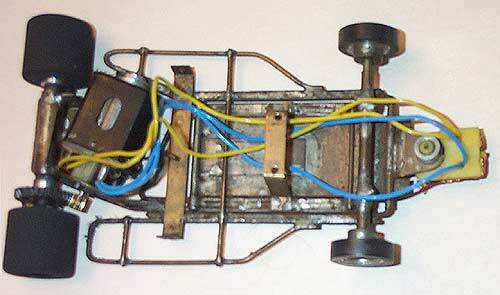 Above: Four chassis turned over. 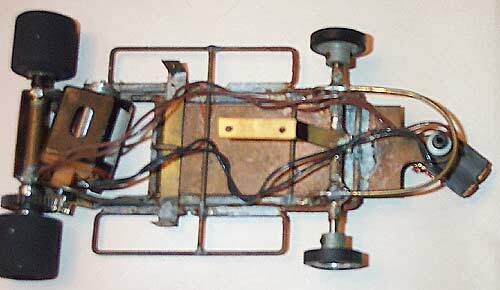 Above: Some slot car racers find the best racing in cars and classes that encourage "nerfing" - the fine art of deslotting an opponent from the inside lane. 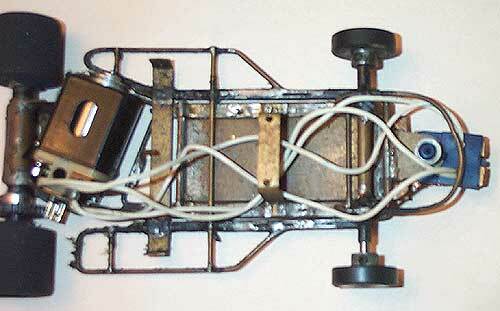 The slot racing can get as rough-and-tumble as the real Modifieds! 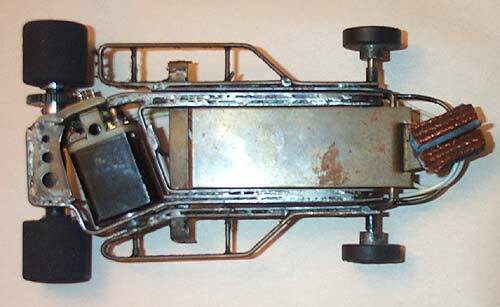 Above: Slot cars modeled after Modifieds or Dirt Track Cars are often built with side bumpers between the wheels, and for the same reason: you don't want the competitor's tires 'tween there! 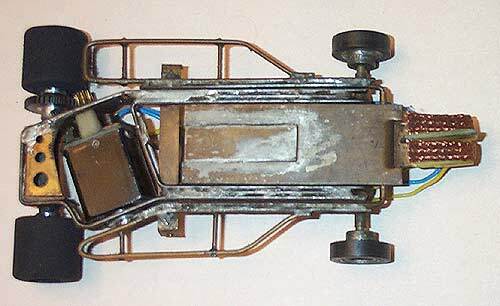 Above: This racer has a guide guard made from curved brass rod. Must be some tough racing hereabouts. Above: Note the wide, heavy Champion drop arm. Above: Here's the third chassis - these motors look powerful, too, to push these heavy chassis around. 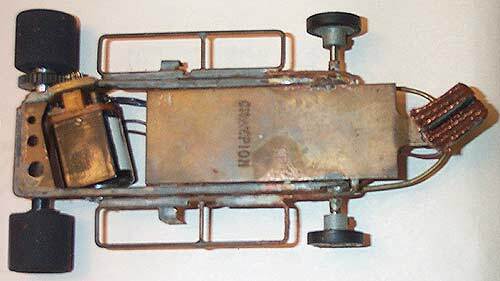 Above: In some forms of slot racing, it is required that the body completely hide the chassis, when viewed from above. This rule doesn't apply to Modifieds! Above: I think this is a Riggen Ready-To-Race NCC Can-Am car from about 1970. It has been customized, plumbered. Compare with this one.